In 1874-1875, this area was settled by a group of Mennonites led by Cornelius and Peter Jansen. Many of these settlers were descendants of Dutch emigrants who left Holland in the 16th Century and founded a colony in Russia. Coming to Jefferson County, the Mennonites purchased some 25,000 acres of land from the Burlington and Missouri Railroad. The Mennonites had developed a unique pattern of community organization which they retained when they came to Nebraska. Their community as a whole was composed of several so-called "line villages," each of which contained a number of dwellings located close together along both sides of a section line or road. About 1900, one such village, "Russian Lane," reportedly contained some 42 houses, churches and schools along both sides of a 4 1/2 mile road. Jansen was named for Peter Jansen on whose land the town was platted in 1886. His nearby ranch was noted for its large sheep-raising operation. Peter Jansen was elected to the Nebraska Legislature in 1898 and 1910, and remained active in political affairs until his death in 1923. Today the Jansen community continues to preserve the spirit of its dedicated pioneers. 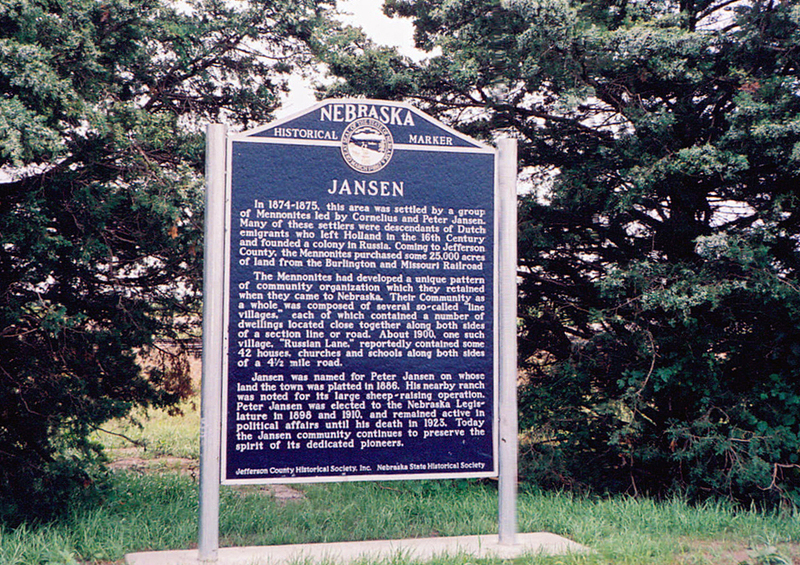 “Jansen,” Explore Nebraska History, accessed April 19, 2019, https://mynehistory.com/items/show/290.